Andreas Kriston was born in Zschopau (Ore Mountains/ Erzgebirge) in 1970. Having finished school and vocational training and being employed in the metalworking industry he was drawn to Berlin in 1990. There he earned his living as a carpenter and eventually as a facility manager on Hiddensee island. 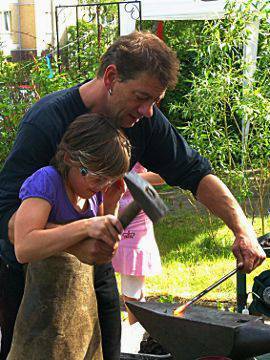 Since 1993 Andreas continuously adopted an artistic and creativ approach to metal working. In 1994 he also began to design metal artwork in various workshops for the youth. Since 1998 he cooperates with “Fusion Intercultural Projects Berlin e.V.”, together they built parade floats for the “Carnival of Cultures” and diverse street furniture and sculptures. After having been employed in a boat centre and an artist blacksmith shop he is working as a freelance artist since 2003. Today Andreas Kriston lives in Berlin's trendy district of Friedrichshain together with his family.